12:39, **. Lee pinned Cruz for the win. 16:40, *** 1/2. Porky splashed Morgan for the win. 9:41, ** 3/4. Fiera had brought a towel to the ring, and had hidden a chain inside of it. He used the chain to batter Love Machine. Straight falls. 14:45, ***. Vampiro pinned Pierroth in the second. Magic turned on Pierroth after teh match, but the tecnicos made the save. 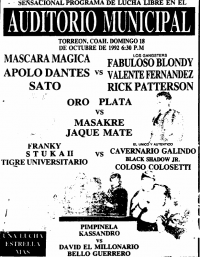 Event Notes: main event was supposed to be Kundra defending his Naucalpan Welterweight Championship against Cortado, but Kundra broke his collar bone on the 09/29 Arena Coliseo show. Talisman Jr. was champion going into the match. Satnaico submitted Latin Lover, Morgan pinned Vampiro. rudo accidentally took out the referee. Top rope broke during the match. 2) Golpeador & Rokambole b El Moro & Nuevo Huracán Ramírez Jr.
Futuro snuck in a foul on Shogun. Bestia won with a top rope senton. 1) Huracán Sevilla & Rayo de Jalisco Jr. vs Gran Markus Jr. & Medico Asesino Jr.
1) Arkángel de la Muerte & Guerrero De La Muerte b Filoso & Talisman Jr.
sets up a title match the next week. Black Magic slipped in a foul for the win. Event Notes: Original plan was a cage match main event, but commission said no. 1) Blue Demon Jr., King Haku, Ringo Mendoza vs Jaque Mate, Masakre, Pierroth Jr.
** 1/4. Three straight dive finishes. Lover Boy beat Piloto Suicida. Those two feuded all thru the show. ***, beast match of thenight. 4) El Dandy, Rayo de Jalisco Jr., Último Dragón vs Jaque Mate, Masakre, Pierroth Jr.
1) Blue Demon Jr., El Dandy, Triton vs Jaque Mate, Masakre, Pierroth Jr.
match was taped for movie Los Guerreros de la Noche. match was taped for movie Los Guerreros de la Noche. Lady Apache worked as a double for star Gloria Mayo. Negra beat Supremo, then unmasked him after the match to continue their feud. 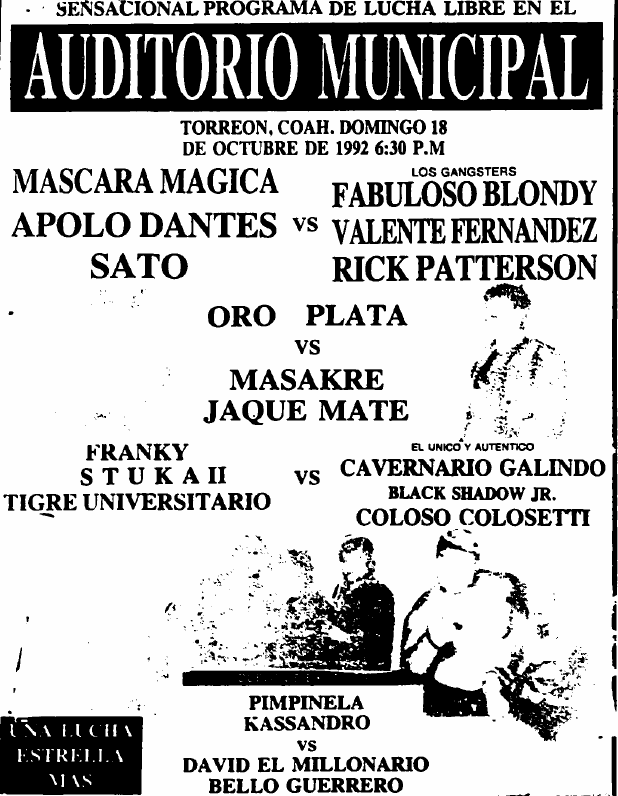 Mascara Magica pinned Bestia Salvaje clean in the third fall, setting up a title match for 10/18. A surprise, since Magica had reportedly given notice to CMLL and was about to go to AAA. rudos were DQed for Patterson foul, just before Atlantis was able to unmasked Pierroth JR.
Sirenita kept the title over Diabolica again. Vampiro's debut in the arena. Apolo replaced Rayo de Jalisco Jr.
4) Vampiro Canadiense vs Pierroth Jr.
1) Oro, Plata, Platino vs Cadáver De Ultratumba, Espectro De Ultratumba, Espectro Jr.
1) America, El Hijo del Solitario, La Fiera vs Blue Demon Jr., Ciclón Ramírez, Nuevo Huracán Ramírez Jr.
Love Machine scheduled in the match, but had already jumped to AAA. 1) MS-1, Pirata Morgan, Satánico vs Atlantis, Love Machine, Rayo de Jalisco Jr.
1) El Supremo I, Espectro Jr., Kung Fu vs Mano Negra, Solar II, Talisman Jr.
Salvaje snuck in a foul to win the second fall. Magica pinned in the second. Salvaje sunset flipped Magica for the clean third fall win. 1) Ministro de la Muerte I & Ministro de la Muerte II vs Caballero De Plata & Gran Jefe Jr. Event Notes: no results are posted, but Mascara Magica, Sato, Oro and Plata are all said to have not shown up later on, and Valente Fernandez and Apolo Dantes had a singles match brawl. Magic snuck a foul on Pokry for the win. Crowd was into it until the finish. 2) Gran Hamada DQ Rene Guajardo Jr.